Thick 1 1/2" tops make a decidedly upscale impression. Abrasion- and stain-resistant laminate over 1 1/2" thick solid core high-density particleboard. Drawers operate on ball bearing suspensions; file drawers extend fully and accommodate letter or legal size hanging files, box drawers extend three-quarters. Cord management grommet. Desk and Return sold and shipped separately?ORDER BOTH. Use with Single Pedestal Desk to form an "L" workstation. Satin nickel crescent pull. 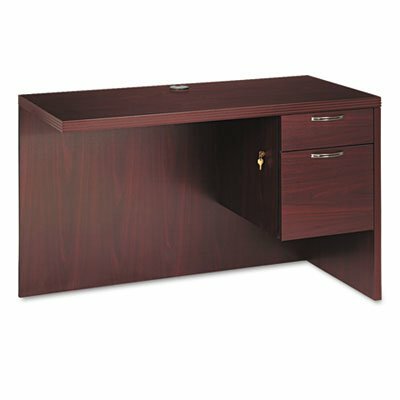 Color: Mahogany; Pedestal Count: 1; Drawer Configuration: Right: Box/File; Overall Width: 48". Desk and Return sold and shipped separatelyORDER BOTH. Use with Single Pedestal Desk to form an "L" workstation. Abrasion- and stain-resistant laminate over 1 1/2" thick solid core high-density particleboard.